Germany dismissed Greek demands to pay World War II reparations after leftist Prime Minister Alexis Tsipras accused Berlin of using legal tricks to avoid compensating Greece for the Nazi occupation of his country. Resurrecting the highly-charged issue has done little to soothe already strained German-Greek relations, as Athens strives to persuade eurozone partners to renegotiate terms of a 240 billion euro bailout. Compounding tensions, Justice Minister Nikos Paraskevopoulos said he was ready to endorse a court ruling allowing Athens to seize German state-owned property to compensate victims of a World War Two Nazi massacre of 218 Greek civilians in the village of Distomo. Berlin is keen to draw a line under the issu,e and officials argued on Wednesday that Germany has honoured its obligations, including a 115-million Deutsche Mark payment to Greece in 1960. “It is our firm belief that questions of reparations and compensation have been legally and politically resolved,” Chancellor Angela Merkel’s spokesman Steffen Seibert said on Wednesday. “We should concentrate on current issues and, hopefully what will be a good future,” he said, adding that the dispute did not, however, affect euro zone talks with Greece on its bailout. However, German media jumped on the demands to highlight the depths to which relations have plunged. Right-wing tabloid Bild, critical of Greece’s failure to implement reforms, splashed “Greeks Demand Billions for Nazi Crimes” on its front page. Resentment in Greece about Nazi atrocities runs deep, and the Greek media have depicted Merkel and her finance minister in Nazi uniforms. 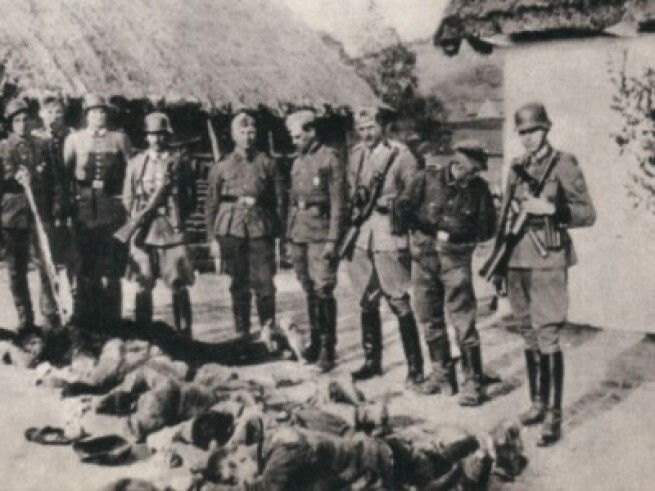 The Nazis destroyed hundreds of Greek villages, killed more than 20,000 civilians between 1941 and 1944, and largely eliminated the country’s Jewish population. Germany argues that the 1990 Two Plus Four Treaty, signed by then-East Germany and West Germany, and the four members of the WWII-era Allies before reunification, draws a line under future claims. Not all Germans agree. Annette Groth, of the Left party, said Berlin should honour 11 billion euros linked to an “occupation loan” which Nazi Germany forced the Bank of Greece to make. “It is Germany’s moral duty to pay the money, even if there are different opinions on international law,” she told Reuters. The European Central Bank is pursuing a restrictive policy on Greece to pressure Athens and its official lenders to agree to a path that will lead the country out of its crisis, Greece’s finance minister said today (12 February). “The ECB in my opinion is pursuing a policy that can be considered asphyxiating toward our government,” Greek Finance Minister Yanis Varoufakis told Greece’s Mega TV in an interview. The ECB has refused to give Athens any leeway to issue short-term debt to meet its funding needs amid a cash crunch as leftover bailout funds remain on hold. Varoufakis said that the ECB’s stance is also aimed at Greece’s eurozone partners and the International Monetary Fund funding its bailout, as a way to also force them to find a solution with Athens. Schäuble has said that no aid would be handed to Greece until international lenders had agreed that it had delivered on its reform commitments. Varoufakis said he is aware that his presence in the Eurogroup meetings has irked many finance ministers who had been used to dealing with a Greek government that ruled with directives via e-mails and faxes. “Suddenly they realised that the Greek finance minister will be a problem for them, to the extent that he demands the right to have the Greek people’s view heard,” he said, calling it an educational process for his colleagues to bring politics back to the Eurogroup. “The depoliticisation of economic policy at the Eurogroup has led Europe to deflation, with its people stating in Eurobarometer polls that they do not trust the European Union’s institutions,” Varoufakis said. Greece secured a four-month extension of its financial rescue on 24 February, when its eurozone partners approved an economic reform plan that backed down on key measures and promised that spending to alleviate social distress would not derail its budget. Germany's rejection of an initial Greek request for a six-month loan extension forced Athens into a string of politically sensitive concessions, postponing or backing away from campaign promises to reverse austerity, scrap the bailout and end cooperation with the "troika" of EU, ECB and IMF inspectors.